There are numerous things I will miss about OPRF, but the Huskie sports are among those parts of high school I will miss the most. Another one of my favorite high school memories occurred when I was standing in the dog pound 163 miles away from OPRF. Watching the softball team win a second straight championship in Peoria, I truly felt the Huskie spirit. When graduate Mariah Scott hit the game-winning home run in the seventh inning, the crowd erupted, and minutes later graduate Chardonnay Harris struck out a Lincoln-Way East hitter to win the title. “Having all my friends there supporting me and seeing us win was the coolest experience ever that we’ll all remember long after high school is over,” senior softball player Maeve Nelson said. My favorite game every year to attend is the annual boys’ basketball showdown against the Friars at the UIC Pavilion. The rivalry is apparent on the court as well as between the two fan bases. While there were some tough losses in the game, the Huskies took this year’s game, going out on top. I love sports because they bring people together, and at OPRF that could not be more true. 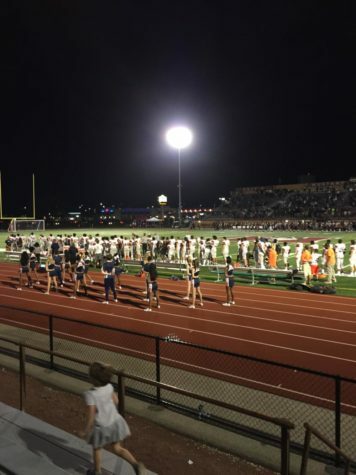 Whether if it’s teammates bonding together and trying to live up to the years of past success from OPRF or fans coming together to support their peers, the sports culture at OPRF is memorable. You can look at the results the teams have had and see how successful teams have been. The wrestling team continues to dominate and contend for state titles every year, including the team championships they took home two of the past four years. 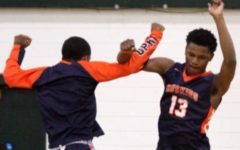 The football team came close to winning a conference title last year, and the boys’ basketball team had a phenomenal run in the state tournament a year ago, including an upset victory over defending state champion Curie. Last spring, the boys’ volleyball team won nine straight matches to advance to the state quarterfinals. This year, the boys’ soccer team won its first conference title in a decade under second-year head coach Jason Fried. While the successes on the field or court are remarkable on their own, the bonds formed between teammates and the camaraderie of the fans in the stands will last longer and be more meaningful than any victory or championship. Through sports teams, student-athletes at OPRF have made friendships that will last beyond high school. “My teammates and I have went through adversities that have taught us life lessons that we’ll never forget and have made us closer,” Hayes said. Some of my favorite highlights from high school come from the sporting events.